For nearly half a century, the Whitney Museum of American Art’s Marcel Breuer building has dominated Madison Avenue and 75th Street. But with the Metropolitan Museum of Art preparing to take over the space, a flurry of construction — including what may be an Apple store — could be construed as the Met effect. In October, the Whitney closed its doors in anticipation of its move to a space designed by Renzo Piano that is scheduled to open in the meatpacking district in May. But the Brutalist style Breuer building, which opened in 1966, will not stay dark long. It will reopen to the public in March 2016 as a satellite location for the Met to showcase contemporary and modern art. When the Met arrives on Madison Avenue, it will find a block that has been substantially altered. The starkest change is happening next door, where six 19th-century brownstones on Madison Avenue, along with two neighboring townhouses on East 74th Street, are being converted to condos and retailing. It has been reported that Apple will open a store at 940 Madison Avenue in the United States Mortgage and Trust Company building, a limestone and marble building from 1922 designed by the architect Henry Otis Chapman. Apple has made no announcement about a new location and has declined to comment on its plans. However, work is now being done at the 92-year-old building. Luxury retailers are increasingly drawn to the area. In October, the German fashion designer Tomas Maier opened a boutique next door to Carolina Herrera on Madison Avenue north of East 75th Street. And last month, the French fashion designer Roland Mouret opened a 1,400-square-foot flagship directly across the street from the Breuer building. “I would say that the block is as transformed as any block in New York City,” said Daniel E. Straus, a health care magnate who bought the collection of brownstones and a townhouse from the Whitney in 2010. The brownstones, which date to the 19th century, have been gutted, leaving only the facades, to make way for 10 luxury condos at 33 East 74th Street and 17,300 square feet of retail space at 935 Madison Avenue. One of the brownstones, which was stripped of its historic detail in the 1930s, was demolished. The changes seal the block’s future as a tourist destination. An Apple store would most likely be a major draw, as the company’s flagship store at Fifth Avenue and 59th Street is frequently mobbed with shoppers and tourists alike. And the Breuer building could receive a substantial increase in visitors. The Whitney attracted around 350,000 visitors a year, with lines frequently winding around the block. But the Met draws 6.2 million visitors a year to its Fifth Avenue and Cloisters locations. If just 10 percent of those visitors — 620,000 people a year — were to walk the short distance from Fifth Avenue to Madison Avenue, attendance at the Breuer building would almost double. “There will be a lot of people who will be walking between the two buildings and experiencing all that Madison Avenue has to offer,” said Matthew A. Bauer, the president of the Madison Avenue Business Improvement District. 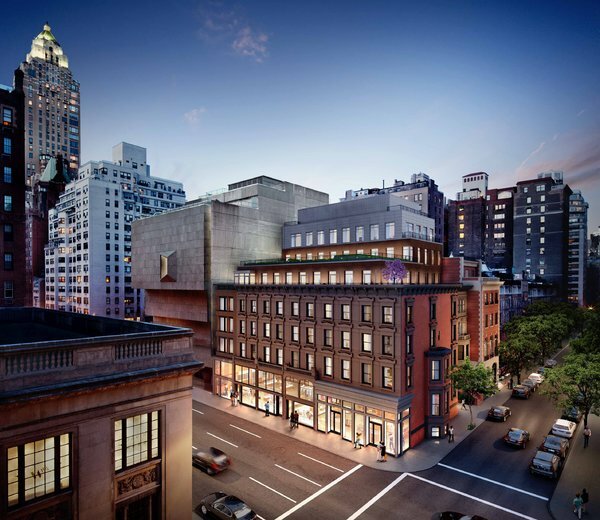 “This block is going to go from being an Upper East Side block to being a must-see,” said Joel E. Isaacs, the president of Isaacs and Company, which is marketing the retail space at 935 Madison Avenue. Even without the Met, Madison Avenue is a shopping magnet, with retailers steadily inching north from East 57th Street. Asking rent for retail space is about $1,500 a square foot on Madison Avenue in the mid-70s, not much lower than the $1,800 a square foot retailers pay on Madison around East 57th Street, according to Faith Hope Consolo, the chairwoman of the Retail Group at Douglas Elliman Real Estate. But when Mr. Straus bought the properties from the Whitney for $95 million in 2010, the block’s future was not entirely settled. The Whitney had already decided to leave the Upper East Side, but it had not found a tenant for the Breuer building. It wasn’t until 2011 that the Met announced its intention to sign an eight-year lease with the Whitney. “I would love to take credit for brilliance, but I think it’s really fortuitous,” Mr. Straus said. For decades, the brownstones and townhouses that neighbor the Breuer building have had an uncertain fate. Over the years, the Whitney made various attempts to transform them into additional museum space, fielding designs by the star architects Michael Graves, Rem Koolhaas and Mr. Piano, none of which were ever realized. Known as the Whitney brownstones, the six that line Madison Avenue were built in the 1870s in the Italianate and Greek Revival styles. One of the properties, a 33-foot-wide mansion designed by the architect Grosvenor Atterbury on East 74th Street, was built in 1901. Over the years, the Whitney used the properties as office space with retailers on the ground floor. But after the museum committed to a new space overlooking the High Line park, it sold the parcels to raise money for the project. Because the properties are in a landmark district, Mr. Straus had to win approval from the Landmarks Preservation Commission for the design by Beyer Blinder Belle, which includes a three-story penthouse addition. The 14,300 square feet of retailing, spread over the ground and basement levels, could be divided into as many as five storefronts. The ground floor space will have 18-foot ceilings. The ceilings in the basement level will be 10 feet high.